Estate size tiered pagoda-like fixture with durable brass construction. 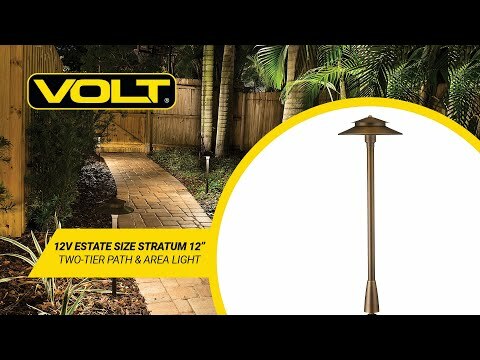 This Estate Size Two-Tier Path & Area Light is a high-quality outdoor lighting fixture that projects an extra-wide circle of uniform illumination. The 12" diameter estate size two-tiered hat is a distinctive feature that makes a bold statement in the landscape. This is a fixture that fits best in a more expansive setting along with estate-sized architecture. Solid brass construction for lifetime of beauty and durability. Pre-aged antique bronze finish - a natural patina that does not corrode. Accepts halogen or LED G4 lamps. 12" shade has a highly reflective undercoat for maximum illumination. Accepts halogen or LED G4 Bi-Pin bulb. 4' standard hub ready 18 AWG, SPT-2 premium tinned copper lead wire. 1.4" thick stem includes extra-long (1") strip resistant threading for greater stability. Large, 17" mounting stake is included for greater stability. Dimensions Entire Fixture: 36.25" x 12" Stake: 17" x 4"